CM Richey Electric is dedicated to being on the forefront of Green business practices and providing energy efficient solutions to our customers' electrical requirements. 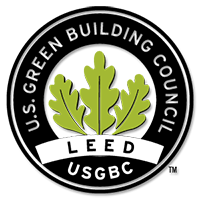 Along with being a part of several high profile Gold and Silver LEED certified projects, we are an active member of the USGBC Long Island chapter. We have the office staff that understands the paper work required for these projects and field personnel experienced in the installation of Photo-voltaic and Electrical Co-generation systems, LED lighting fixtures, and BMS & HVAC control wiring applications. We are also able to assist the end user with the utility paper work required to get applicable rebates on all designated equipment that is utilized. Let us help you design and build your project with the newest Green technologies available.